Today I thought I would do something a little different for me and let you know about a great body care find that I found, and its under $10 CAD! I happened upon the Calgon Ageless Bath - Exfoliating Mineral Scrub while I was in Walmart looking for a body scrub. I had seen that Walmart carried the Tea Tree Body Scrub that I liked and was going to pick it up but there was only one jar left and there was no seal on the jar...ewe. I saw the Calgon and thought I would give it a try, it was sealed! I could see through the jar that it looked like it would be nice and scrubby! What Calgon says on the back of the tub - Scrub away signs of aging. See smooth, even-tones skin and feel luxurious softness after each use. Our unique formula with exclusive Vita-Pearl technology with Pearl Powder, Vitamin E and Collagen exfoliates dry, dead skin cells and relaxes the body as you soak. Directions: As a scrub, apply all over body in circular motions in shower or bath. As a bath soak, pour a handful under warm, running water. Stir water to help dissolve. I have keratosis pilaris on my upper arms and find that if I use a body exfoliator a few times a week, I can keep the bumps somewhat at bay. Having smoother arms, especially in the hot summer months when I prefer to wear tank tops and short sleeves just makes me feel more comfortable. 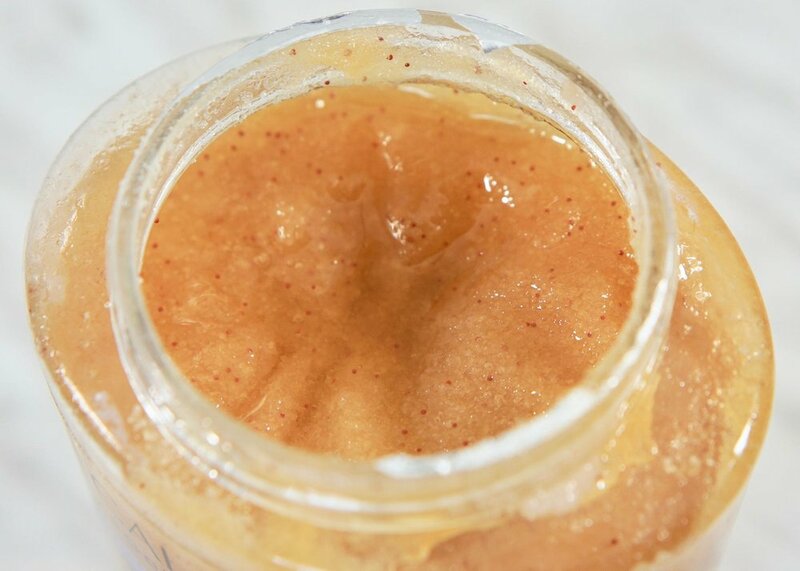 As you can see by the above photos, the Calgon Ageless Bath - Exfoliating Mineral Scrub is nice and gritty so it is able to give a great exfoliating scrub. I believe that it is a salt scrub as it doesn't dissolve as quickly as sugar scrubs tend to. I have been using this scrub every second or third day for the past few weeks and the bumps are all but gone on my arms! My whole body feels so soft and smooth after using it. The scrub has oils in it to help to moisturizer the skin, my skin isn't dry feeling when I get out of the shower but I do still use a light moisturizer afterwards. If you are scent sensitive, or just don't like scented products, be warned that the Calgon Ageless Bath does have a scent. I can't quite place the scent, its kind of between floral and fruity-but not in a bad way! I don't mind the scent that much, it is strong when you first put it on your skin but it does fade and I can't smell it once I am out of the shower. I am not sure if there are other scents, if there are I haven't found any in my searches. If you are a bath person, it does say that you can use the scrub as a bath soak as well. Im not a fan of baths so I won't be trying it out that way! But if you are on the hunt for a great scrub at a steal of a price, $6.97 CAD at Walmart, I really don't think you could go wrong with the Calgon Ageless Bath. For myself, I can definitely see myself repurchasing the Calgon Ageless Bath - Exfoliating Mineral Scrub once I run out. I like the price and I am liking the results I have gotten so far. The only gripe I have with it is the tub...if you have been around here for awhile you will have noticed that I am really not a fan of having to stick my fingers into products! But for the price I am willing to overlook the tub.